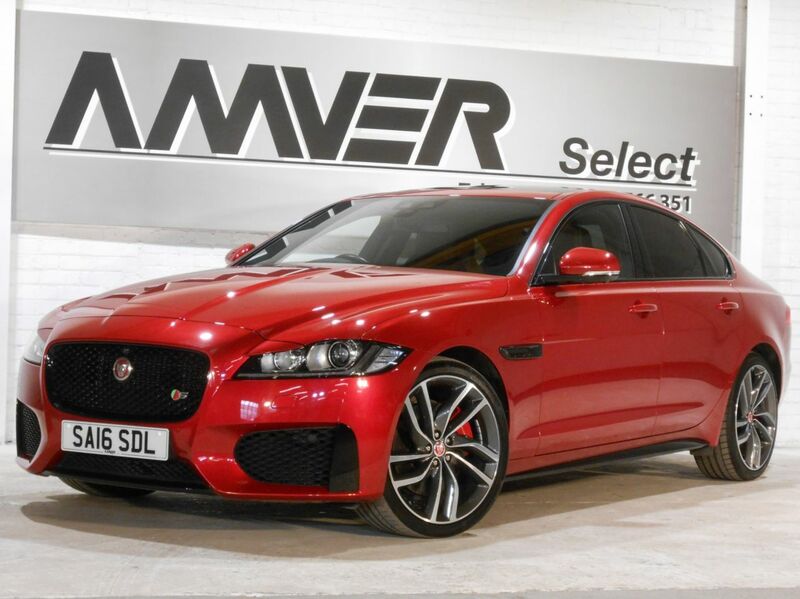 A stunning high performance 300bhp Jaguar XF S with 22,000 miles & full Jaguar service history in Italian Racing Red with exterior black pack, electric sliding panoramic roof & 20" Labyrinth alloy wheels trimmed in Jet leather with Light Oyster contrast stitching & Grey Figured Ebony fascias. Superbly equipped with 360-degree surround camera system, heated electric seats with adjustable lumbar, heated windscreen, WiFi hotspot, Meridian sound system, keyless entry & ignition, front & rear parking sensors, powerfold electric mirrors, automatic Xenon headlights, voice command system, privacy glass & more. Thrilling to drive with its powerful twin turbocharged 3.0 litre V6 engine with Dynamic mode, steering wheel paddles & Configurable Dynamics system allowing customised suspension, throttle mapping, gearbox shift points & steering to suit your performance driving needs. Supplied with complete book pack in Jaguar wallet, two keys & full Jaguar service history. This car comes with six months Momentum Platinum Plus warranty so that you can drive away with total confidence knowing that you are benefiting from what is probably the best warranty cover available in the UK today. We have signed AA's Dealer Promise which means all cars are provided with a full history check, 12 months AA breakdown cover or member upgrade as well as other exclusive AA member benefits.